As Easter approaches, I get out my trusty craft binder and look for the very best Easter Crafts for Kids. I've selected my favorites and am sharing them with you here. Some are my own ideas, some I've collected over the years from other crafters, and some are from trusted websites. I've added any hints and tips I've learned along the way to make these crafts as kid-friendly as possible. I hope you find an Easter Craft that will work for you and your children or for a classroom full of eager crafters. 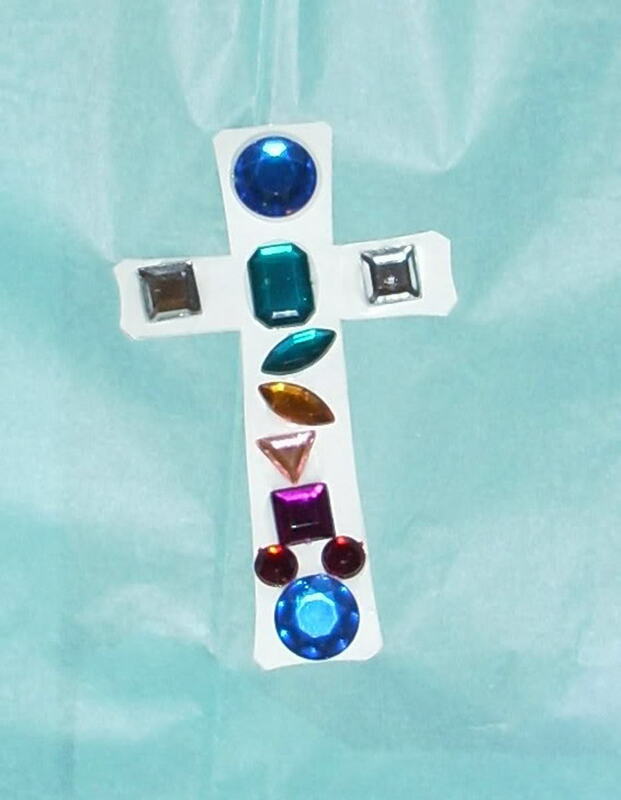 Here's a craft that resembles a stained glass window when complete. This craft can be adapted for any holiday by changing the shape of the outline and the colors of tissue paper used. For Easter, use a cross or an egg shape: Here's an egg shaped template you can print out, then reduce or enlarge from FamilyFun. Tips and Hints: the size of the "window" should be proportional to the age of the child. A young child may "burn out" before he or she is finished with a large window cut out. My 12 year old was able to make a full sized sun catcher from a 9"x12" sheet of construction paper. But a younger child will probably need a shape about 1/2 of a sheet of paper. 1. 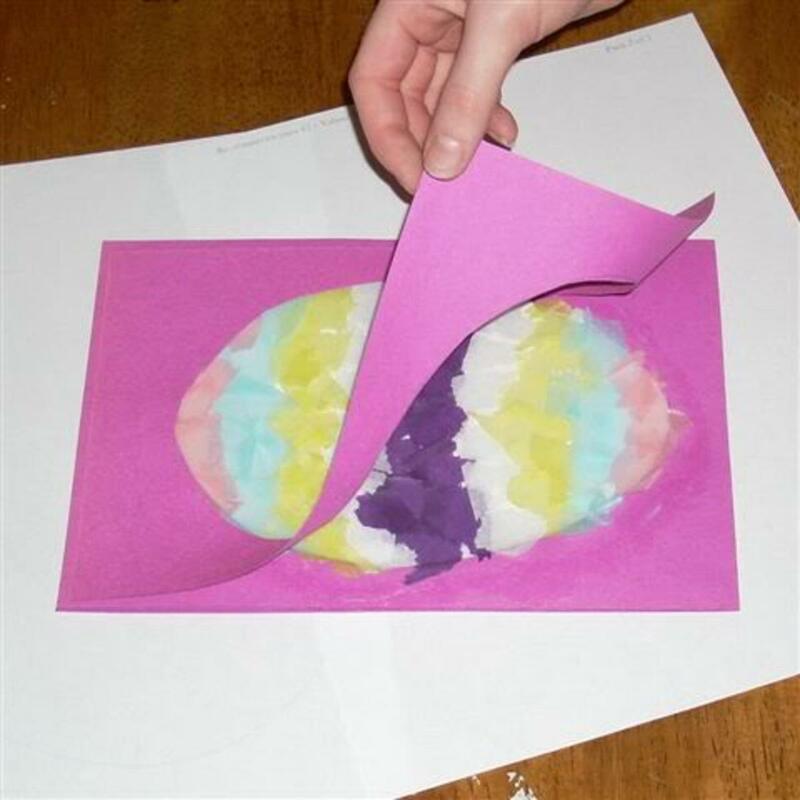 Cut out an egg shape from the center of a piece of construction paper. Repeat, using the first sheet as a guide so the sheets are identical. 2. 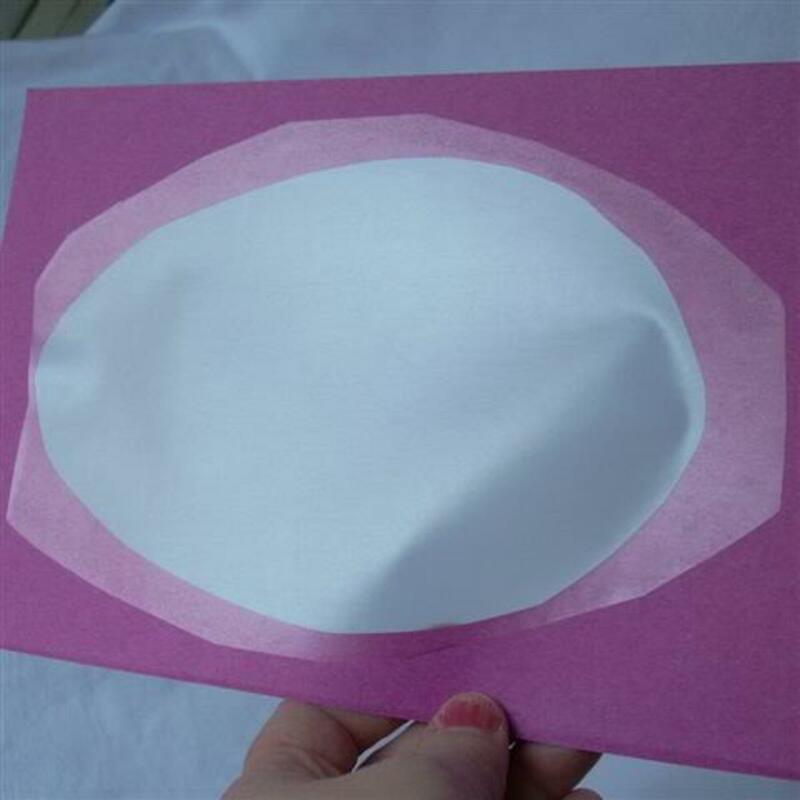 Cut out a piece of clear contact paper about an inch larger than the egg shape and attach it to one of the pieces of construction paper making a "window". 3. Have an assortment of torn tissue paper ready to use in various colors. 4. 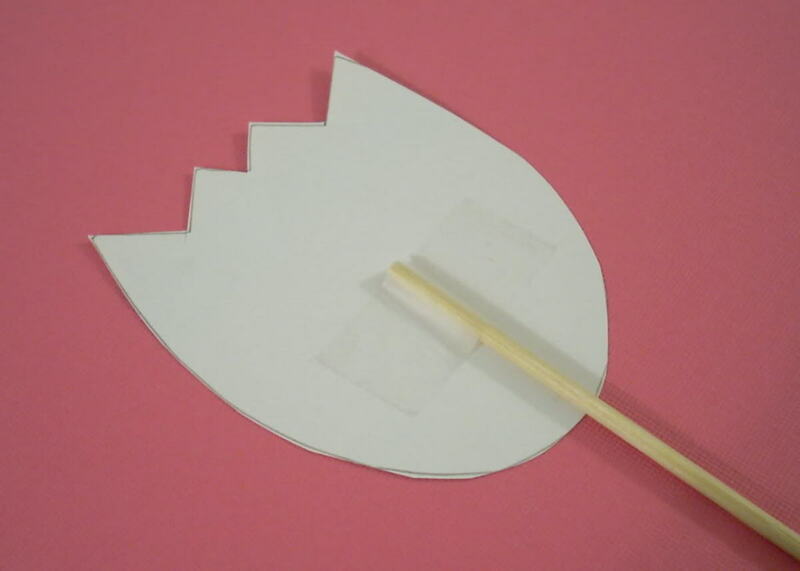 Attach pieces of tissue paper to the sticky side of the "window" of the egg shape until it's fully covered. 5. 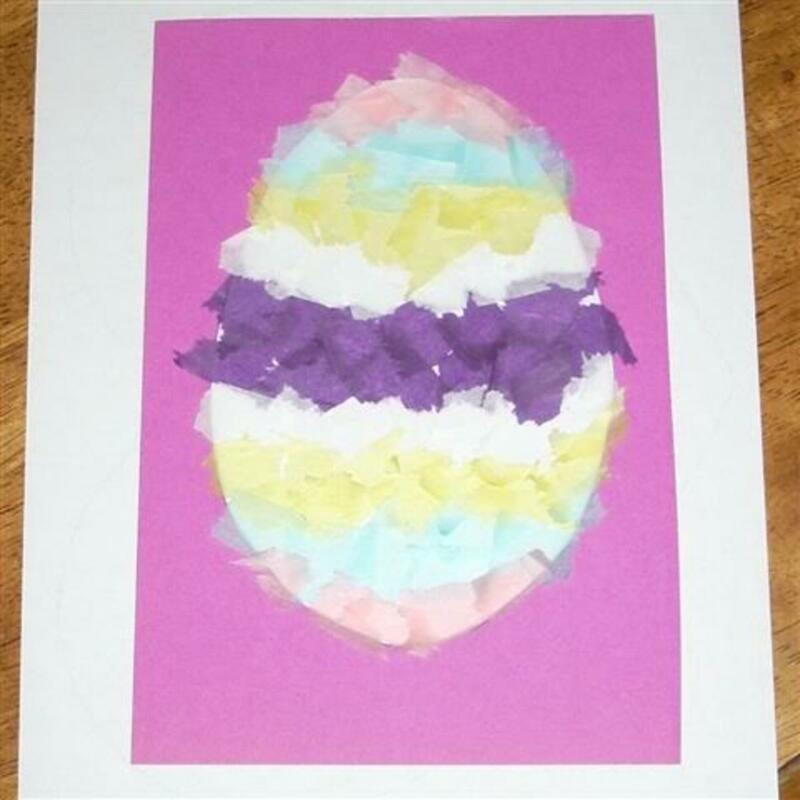 Using glue or a glue stick, glue down construction paper #2 to construction paper #1, lining up the eggs to match exactly. Be sure to glue right up to the edge of the egg shape. Allow to dry if using glue. 6. Cut another piece of contact paper a little larger than the egg shape and carefully press it down on top of the tissue covered egg to seal everything. 7. Trim around egg leaving about 1/2 inch of the construction paper for a border. 8. Punch a hole at the top of the egg and hang in a window. ***Here's an example of this craft we made with a Valentine's theme. Don't forget about the tried and true woven placemat. There are many methods for making placemats - this is the method I use with kids. You leave the main sheet of construction paper intact at one edge. You'll see what I mean. We used Easter colors for this placemat. 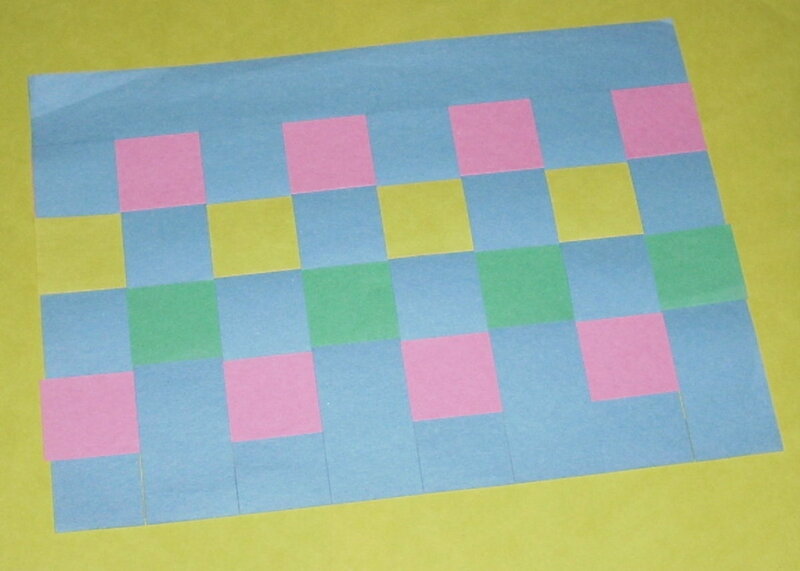 I made the strips rather wide at 1.5 inches (which works out perfect for 9 x 12 construction paper). I made them wide so that we could decorate it with thumbprint art on the resulting squares. Weaving in a strip or two of white paper is great for the thumbprint art since it shows up best on white paper. For younger kids, weaving the placemat is probably enough for one sitting. Older kids could add the thumbprint art especially if they had 2 craft sessions. I've written an article (listed below) all about thumbprint art if you'd like to learn more, but here's a quick example of a cute cat to get you started. 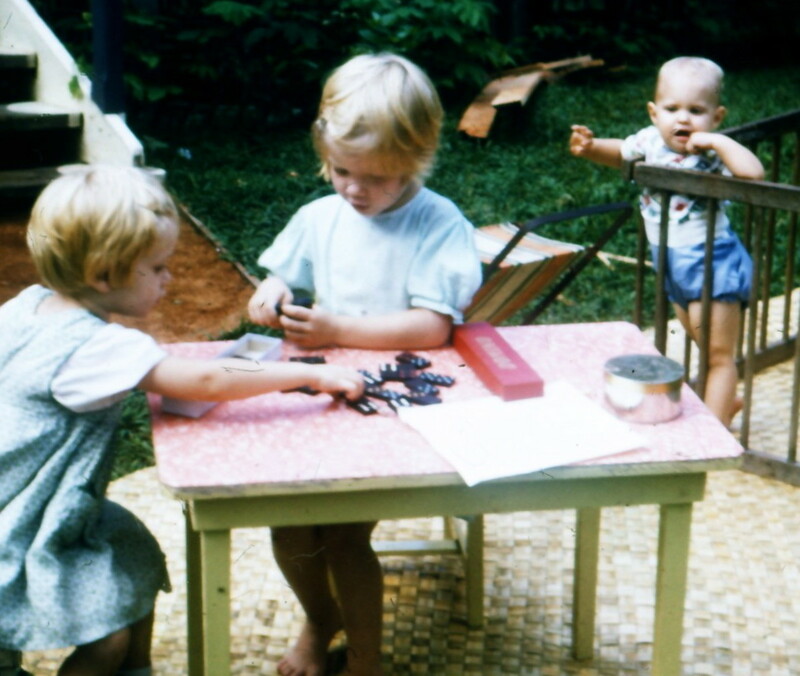 My fondest memories are those of sitting around tables with groups of kids watching them make crafts. As they sit and create, they talk among themselves and fellowship. For me, these are scenes of present day quilting bees where folks take time to create and become better friends through conversation. 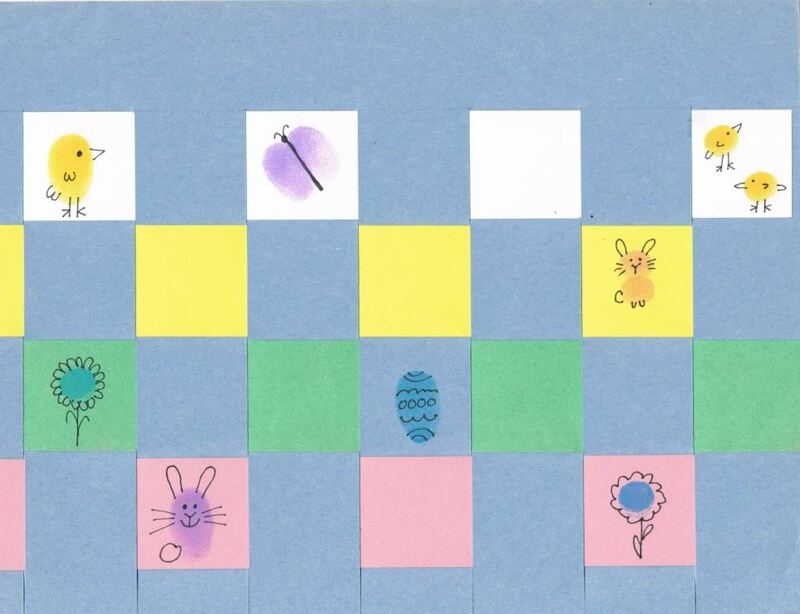 Here's an Easter Paper Doll Chain which can be made from any number of simple Easter symbols. Kids always LOVE paper chains sometimes called paper dolls. We made this duck shape we found online, but bunnies, eggs or flowers would be cute too. I'm going to make a couple more and add them here. I cut our paper to 10 inches long (it had been 11") and folded it back and forth every 2". This made 5 layers of paper. Or you can leave the paper 11" long and fold in half and half again to get 4 layers (refold to make accordion style). The more layers, the harder it is to cut. Use a copier to get your shape just the right width to match the width of your paper. This one is pretty simple once you've got your supplies ready. Spread out newspaper over work tables, portion out the Mod Podge (decoupage glue) to kids and this craft won't be as messy as you think. *I use Mod Podge brand in a matte finish. I like the matte finish better than the glossy. Mod Podge can be found at any craft store. 1. 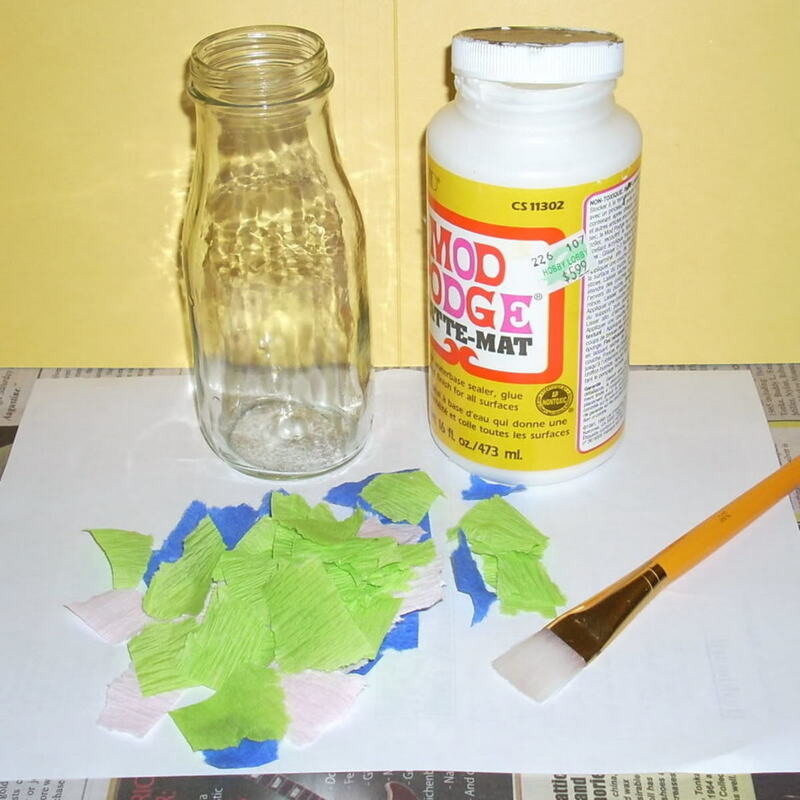 Apply Mod Podge to glass jar with paintbrush one section at a time (so it doesn't dry out too fast). 2. 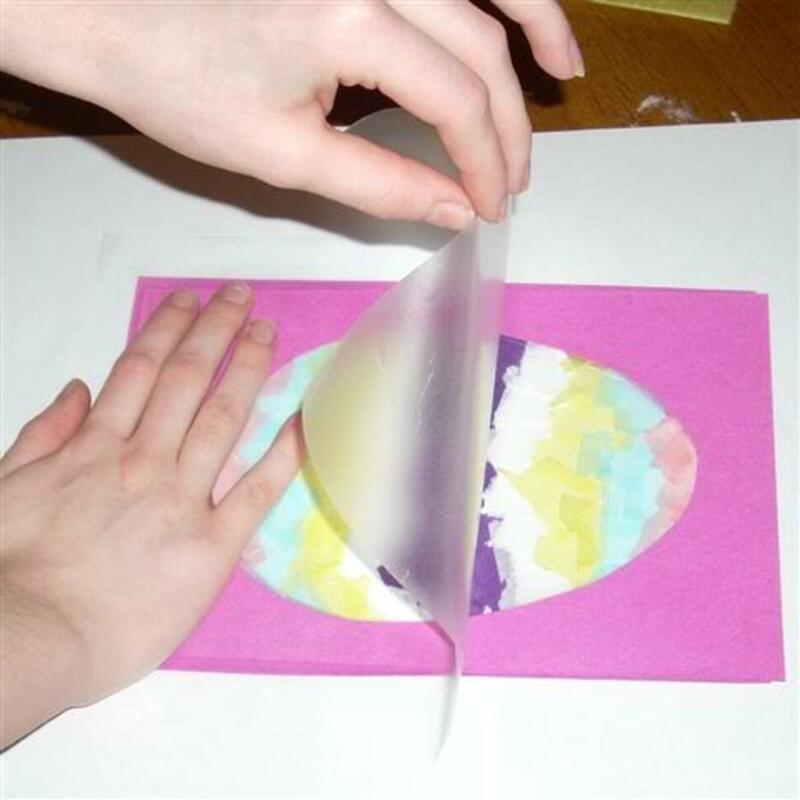 Using your fingers, apply pieces of torn papers to wet Mod Podge overlapping paper pieces. 3. Seal paper pieces with another coat of Mod Podge on top. 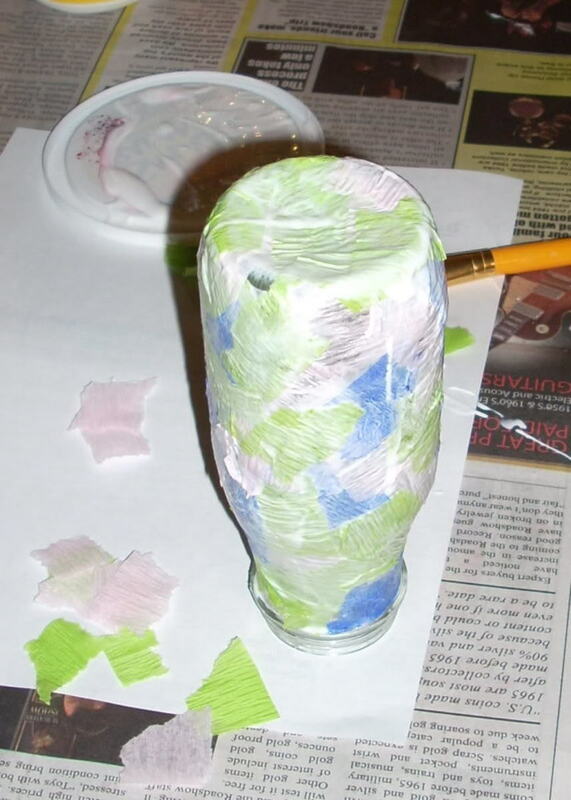 It's fine to decoupage the bottom of the glass jar too, just turn it upside down to dry. 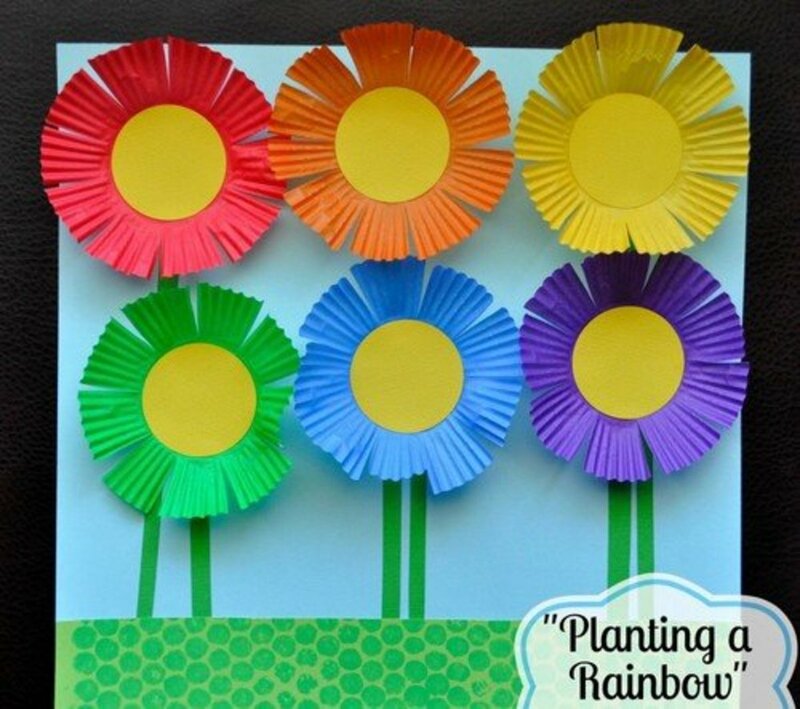 Cut flower shapes out of colorful paper. I found these three flower shapes in an old clip art package. I used some cardboard to make sturdy templates of the shapes. For the paper, I used scrapbook paper, but construction paper or kid-colored flowers from a coloring page will work too. Tape the cut out flowers onto wooden sticks (I used wooden skewers because I had them handy). 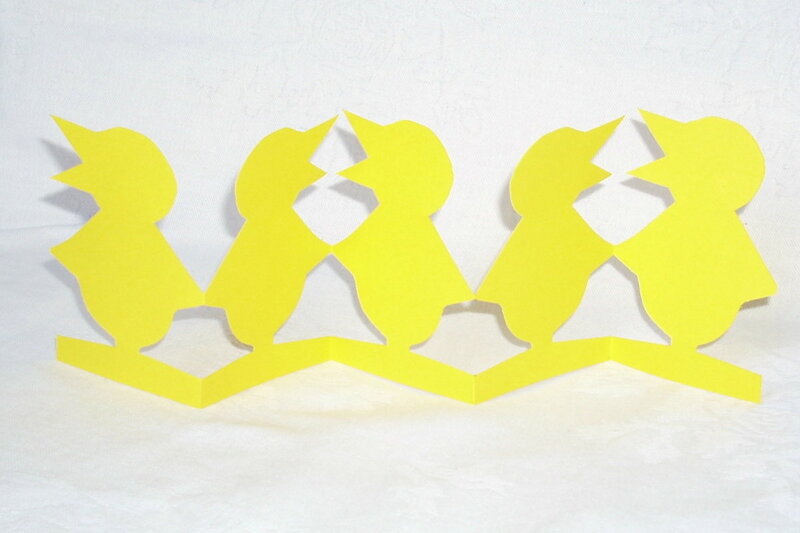 Stick them in floral foam or display them in a vase. 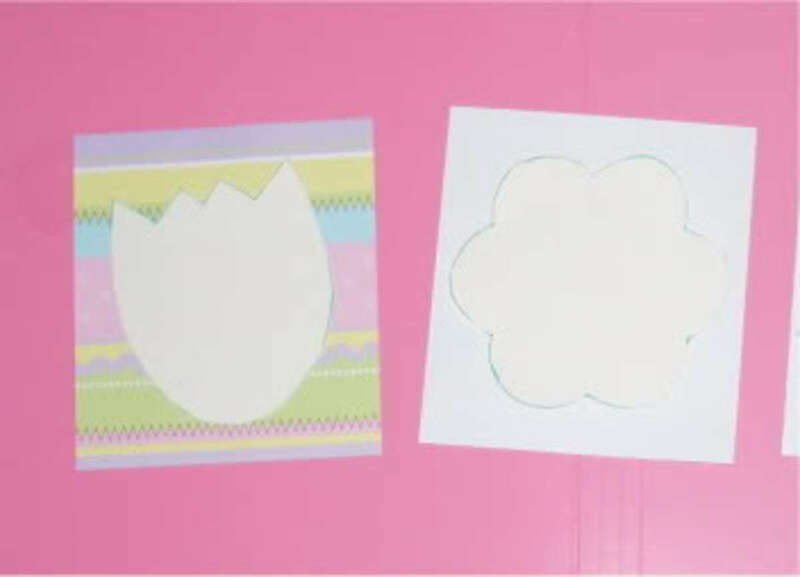 Tips and Hints: If you decide to use scrapbook paper or construction paper, PRE-CUT the paper into squares a little larger than the flower templates (as shown above) before handing it out to children. This will save them frustration from handling a large piece of paper and will save paper too as kids tend to trace things in the center of a sheet of paper - no matter how large it is. I think this would be a fantastic project to make for an elderly person, a sick neighbor or a teacher or school principal. I stuffed white tissue down into the bottle because the sticks weren't long enough to make varying heights. This worked OK, but if the mouth on the jar had been wider, I would have put a piece of floral foam into it. I could have then adjusted the sticks much more easily. Another idea (I hadn't thought of until just now) would be to decoupage the bottle with small pieces of the same scrapbook paper the flowers are made from. The flowers would match perfectly to the bottle. The paper pieces would have to be small though as that paper is thicker than crepe paper. If I attempt this, I'll post it here. Note: Kaboose is no longer available so I can't provide a link to this template. It's not very difficult to duplicate though. 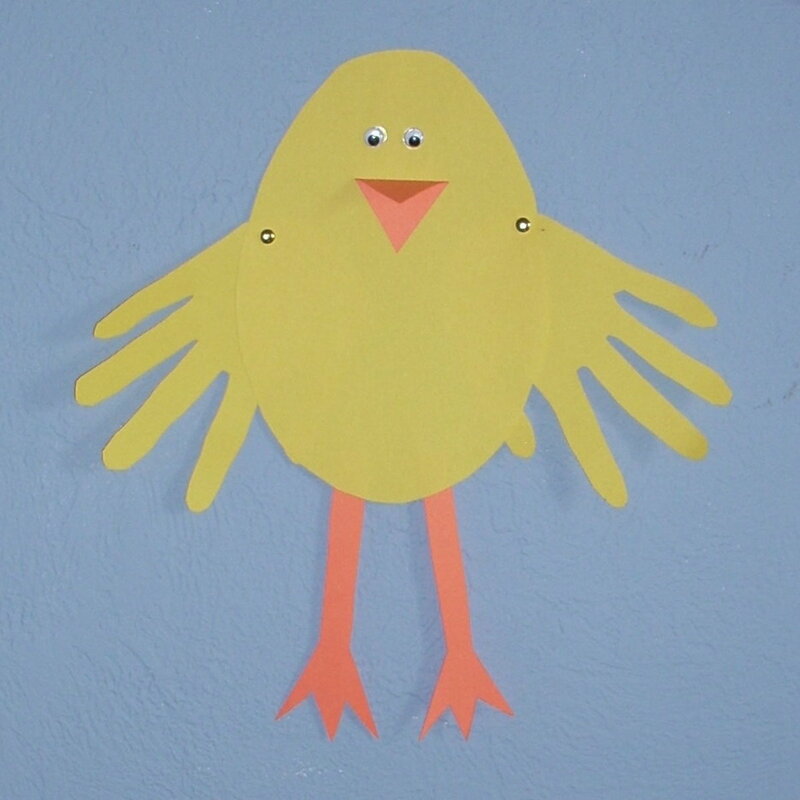 This Easter Chick Craft is from Kaboose and it gets a thumbs-up. The instructions call this an Easter card, but I'm simply using it as a decoration. You'll need a willing set of hands to be traced for the chick wings (shouldn't be too hard to find). My "baby" is almost as tall as I am, but still enjoys holiday crafts so I enlarged the egg shape on the provided template for a better match to the size of her hands. This Easter Lamb Craft is irresistibly cute. 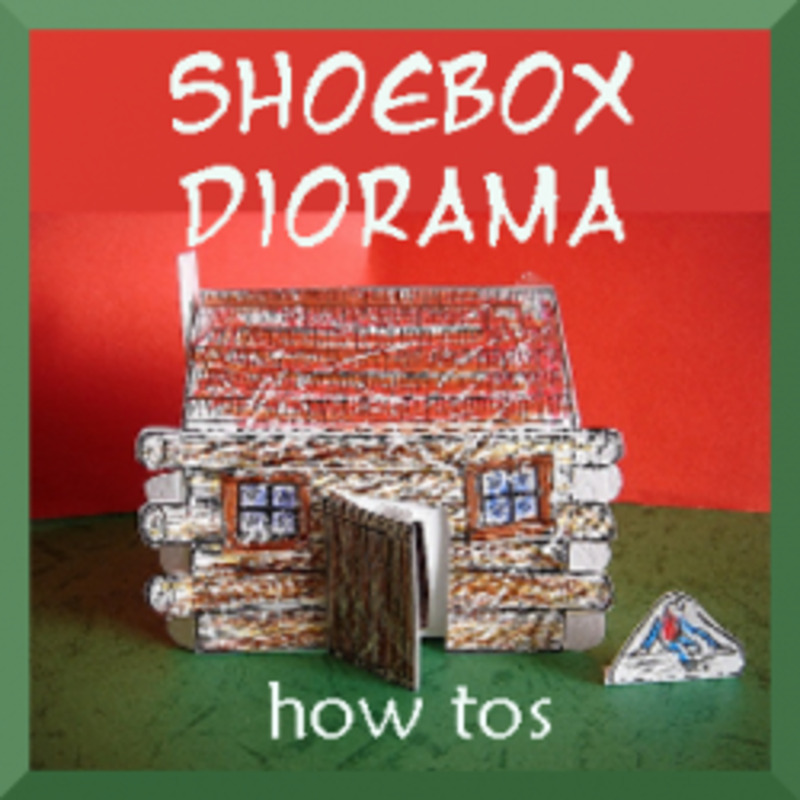 I saw this craft in a girl's club workbook many years ago and have loved it ever since. This is one of my daughter's favorite Easter crafts. I think because the sheep are so cute. 1. Trace sheep template onto white card stock and cut it out. 2. Draw in face of sheep with black marker on both sides of sheep's head. 3. 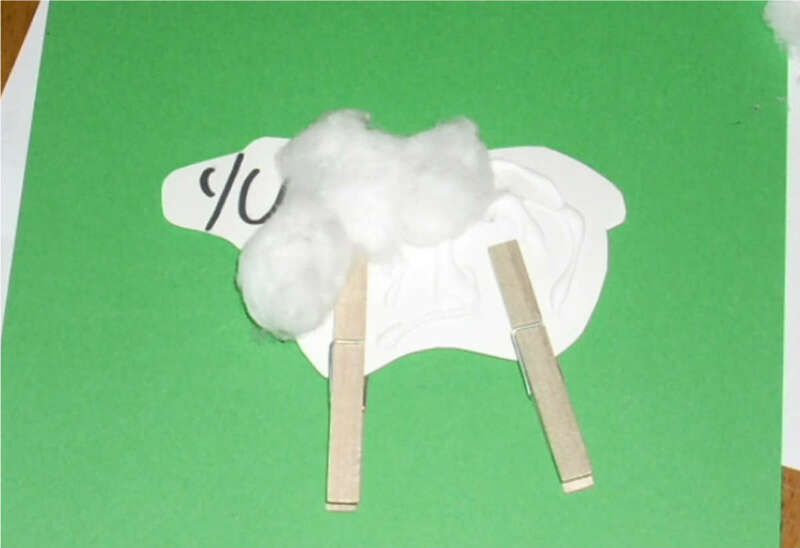 Attach clothespins (sheep legs) to sheep body testing to make sure sheep stands up properly. 4. Using a zig zag or crosshatch pattern, squeeze glue onto sheep body. 5. 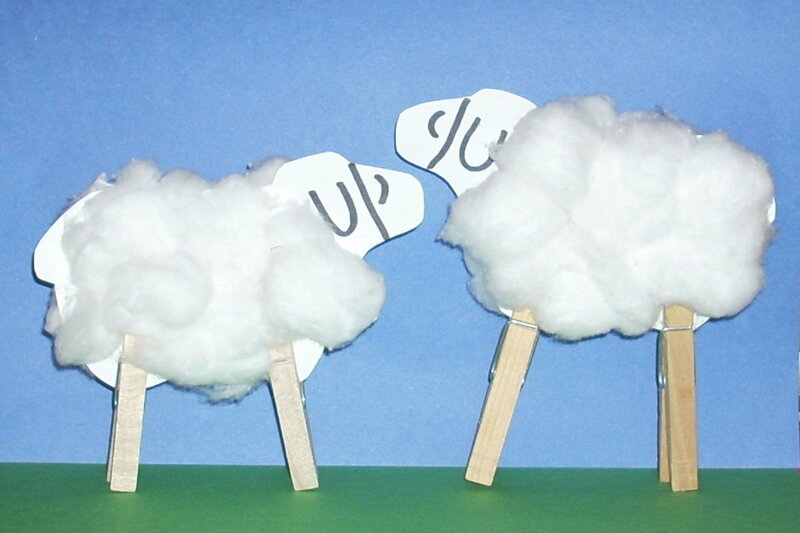 Add cotton balls to sheep's body being careful to not cover the ears and tail. Cotton balls can be used full size or for smaller cotton balls, pull each cotton ball in half and re-roll into balls in the palms of your hands. 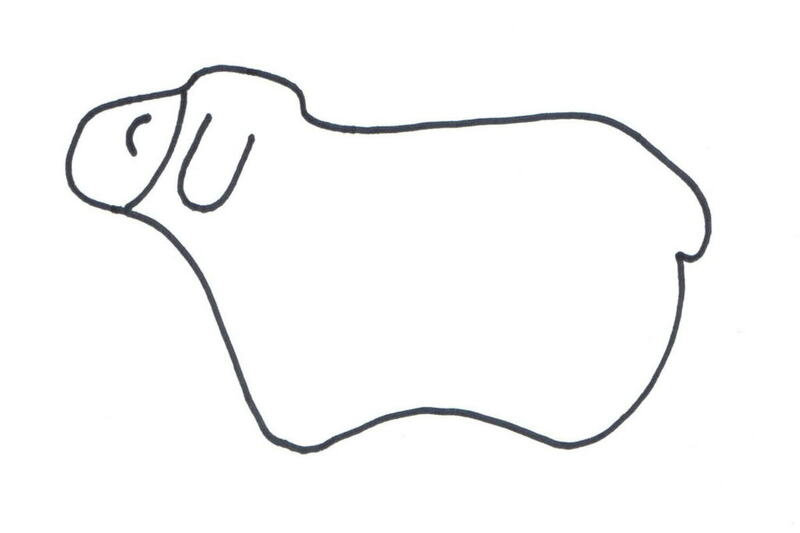 I don't have a pdf file of this sheep template to offer, but I scanned it and am posting it below. Feel free to right-click on the sheep and "save as" to use for this project. This will give you an outline you can tweak to your liking. What's your favorite Easter Kid's Craft? Loved the decoupage bottle. Really nice lens. Thanks for sharing. I like the bottle craft. Thanks for the share. 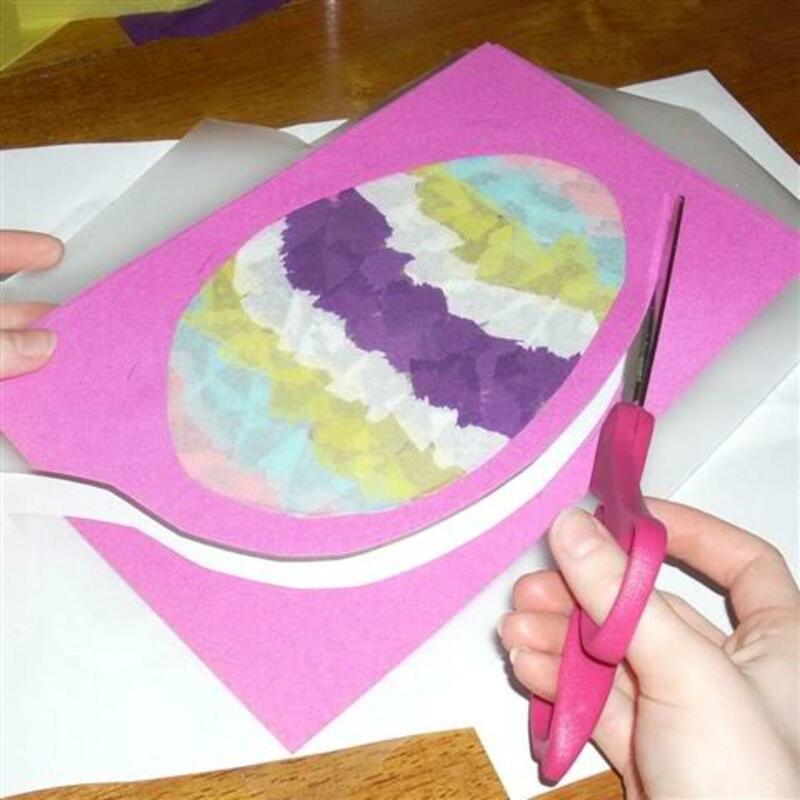 Thanks for sharing these great ideas on Easter crafts for kids. Nice work. I remember how much I loved doing the placemats as a kid. Think I'll do this with my daughter this week. Have a very blessed Easter! Very Interesting lens! Thanks allot for the info. Great Ideas! My son going to love this crafts. 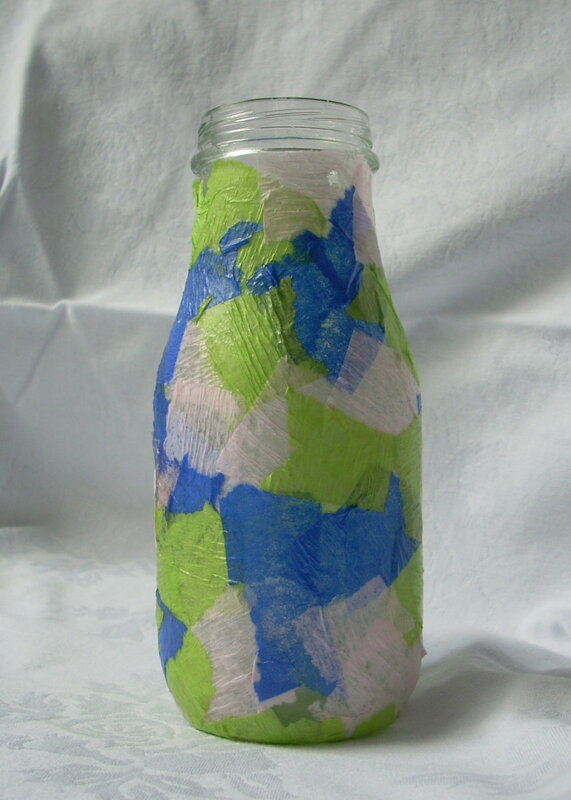 Wow, the glass bottle brings back memories, it was one of the first craft project I remember doing in school. Cool selection of craft projects, thanks for sharing. Lots of great ideas, I especially like the paper ducks! Great lens! Thanks. Thanks for sharing these. My kids would love these activities. Making stained glass windows is a lot of fun, but these are all ones kids would love. Me too! So many to pick from. My kids will love this, I love all the pictures. The stained glass window eggs look like lots of fun. Great lens idea! Thank you for sharing. I used to make a stained-glass window with children using pastel crayons. The children covered their paper with abstract designs. We then 'painted' over them with vegetable oil and when hung on the windows, they looked amazingly like stained glass. Cleaning the classroom windows afterwards is another story! So many nice ideas. Easter lamb is my favourite. Great job on this lens. Keep it up! These are great ideas. I love crafting as a small kid. 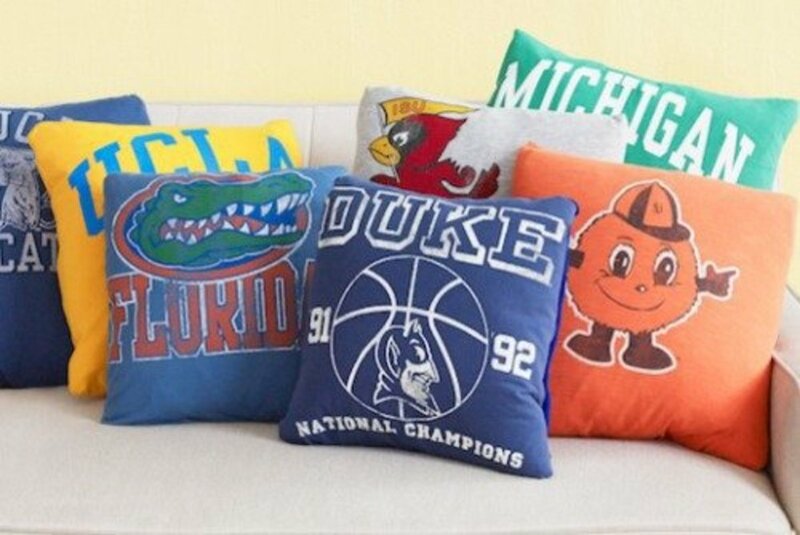 Some really cute ideas. Don't have any little ones, but I am sure people that do would have a lot of fun with these ones you have shown us. Cute ideas that I'll be doing with my boys. When I was little, a babysitter helped us make chicks in eggs by cracking eggs and cleaning the shells, then painting a marshmallow yellow and sticking it into the shell and adding paper beak and marker eyes. Simple, but fun! Could use some of these great ideas myself this Easter! Fascinating lens and ideas ! I like the stain glass egg. Fun ways to bring in the Easter spirit! great lens ! very interesting ! Kids will surely love all these stuff! And maybe they will try to make one since you have included here the ways on how to do it. Nice squid here! 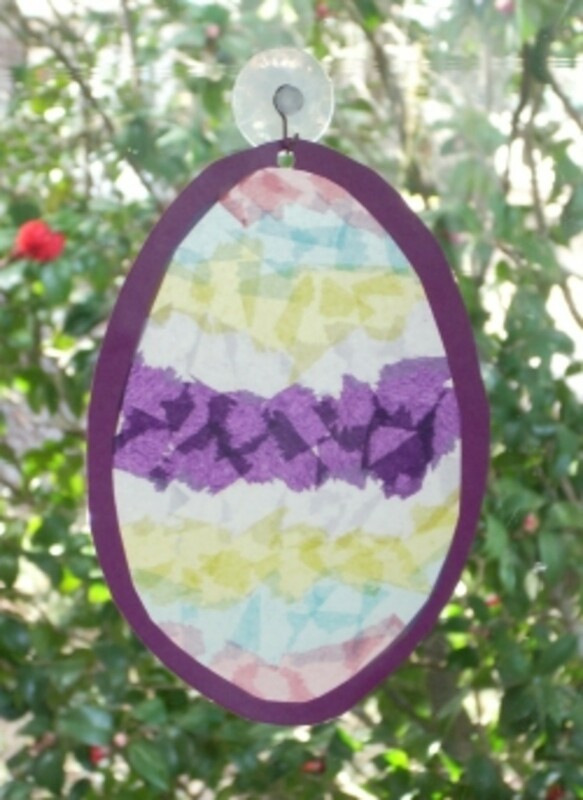 I love the stained glass eggs and have beautiful memories of making similar with my daughter when she was younger. Happy Easter and Easter Blessings. Great ideas for Easter! Thanks for the post and congratuations on the showcase! Have a lovely Easter. Great concept! Great lens! Congrats on being Showcased in the Spring and Easter Crafts. Happy Easter! I still have paper lambs my kids made me for Easter long ago. Easter is a great time for kids to make crafts. The Easter Lamb Craft is very cute. Blessed! A great Easter lens, thanks. great Easter lens! Shared @ Pinterest! Nice ideas, especially the Easter lambs. Lots of great ideas for kids to explore and to have fun with . my son will surely love making these stuffs with me.. Thanks for the idea! 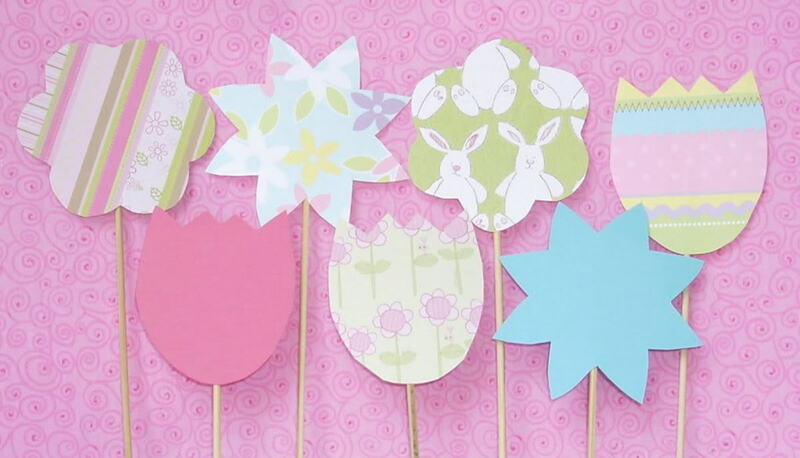 Great Easter crafts for kids, I think these would be great projects. I really like the flower bouquet and the placemat. 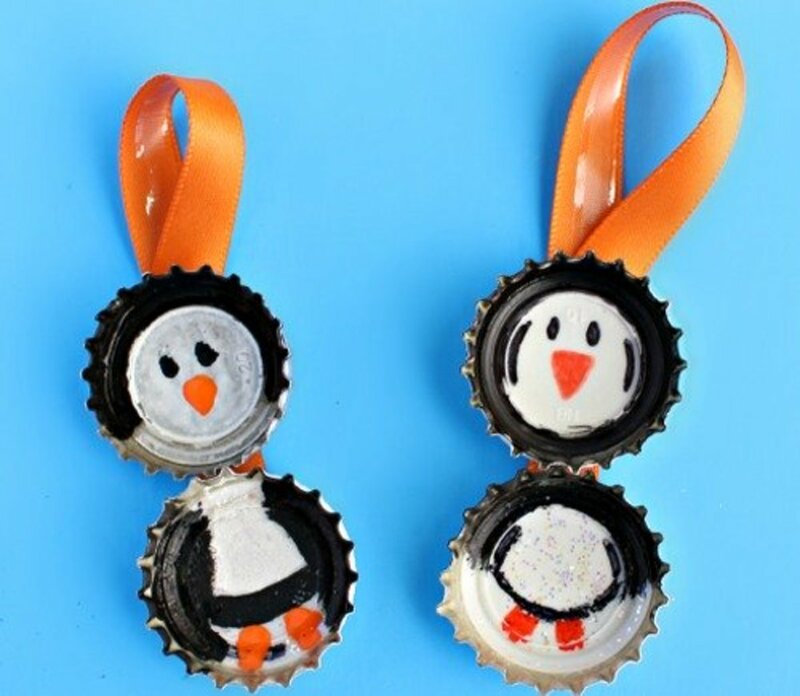 Great crafts to do with your kids. And yes, crafting with your kids is a wonderful opportunity to build great memories. Great crafts for the children - and for grandmas, too. I can appreciate all the time it took to gather all of these. Great crafts, awesome lens! Congrats! Thanks! This is such a fun lense. You gave me so many things I can do with my grandkids. I love this lens. I liked it the other day, but came back. I just added it to my Featured Lens section on own Easy Easter Crafts for Kids page. Adding a kiss for luck on this St. Patrick's Day! 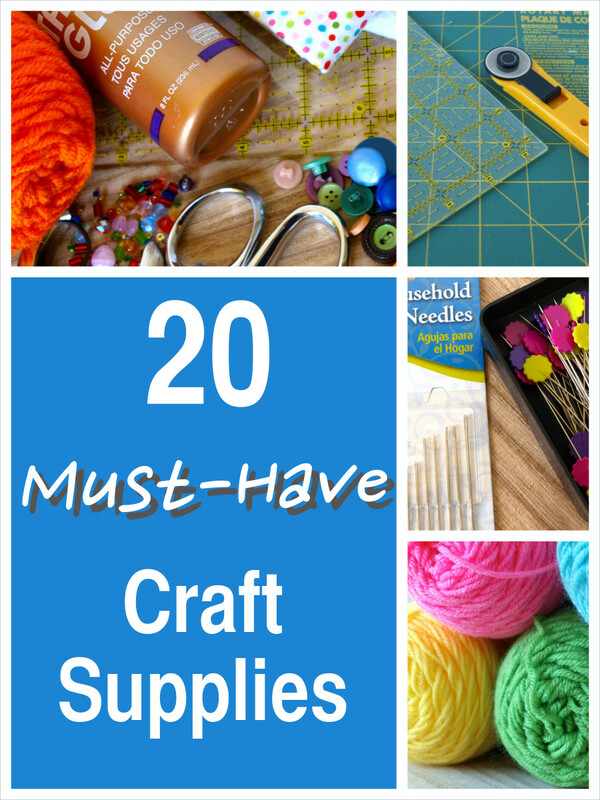 I love all these craft ideas! I think my favorite is the stained glass one. I will have to try that with my 2 youngest daughters when they are home on Easter break. GREAT Lens!!! I wonder if my 2 year old can do the egg stained glass... Might have to try that one out! Thanks for the ideas! Go ahead with your own ways. Thanks for sharing good lens. Wow! Congratulations for your Purple Star, too! Many of these projects my kids have done over the years ..and you've added some that are new to me. Very crafty...congrats on LotD! Congratulations on your LOTD!!! I really like the crafts on here. Great lens. Blessed by an Angel. What a lovely and fun lens to visit and a LOTD! Woot! Great lens, 5*****. Congratulations on LOTD. 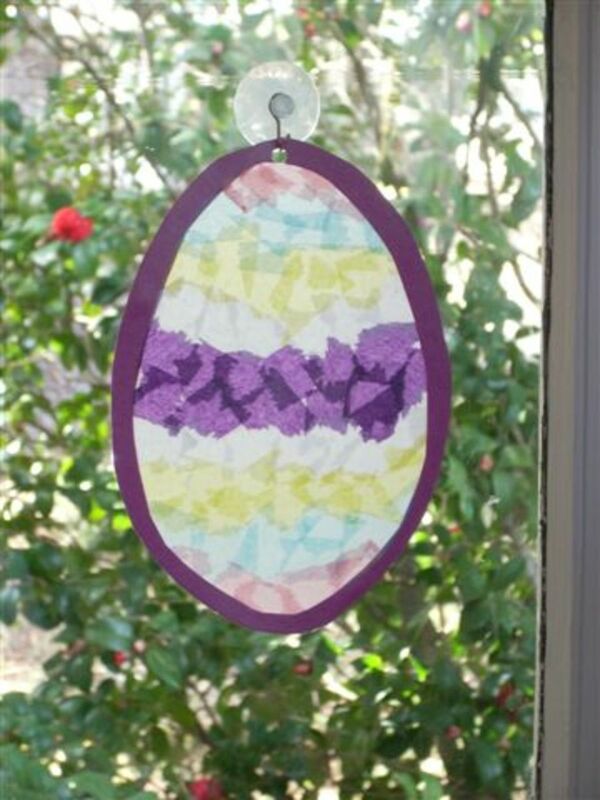 These are great Easter crafts! Lensrolling with my Easter DVDs for Kids. Congratulations on LotD!! I'm kinda picky about crafts, but you've got some cute ones! We have all sorts of traditions around The Eggs...but could add a craft or two. Congrats on LotD and 5 big *! almost makes me wish the kids were still little! excellent. 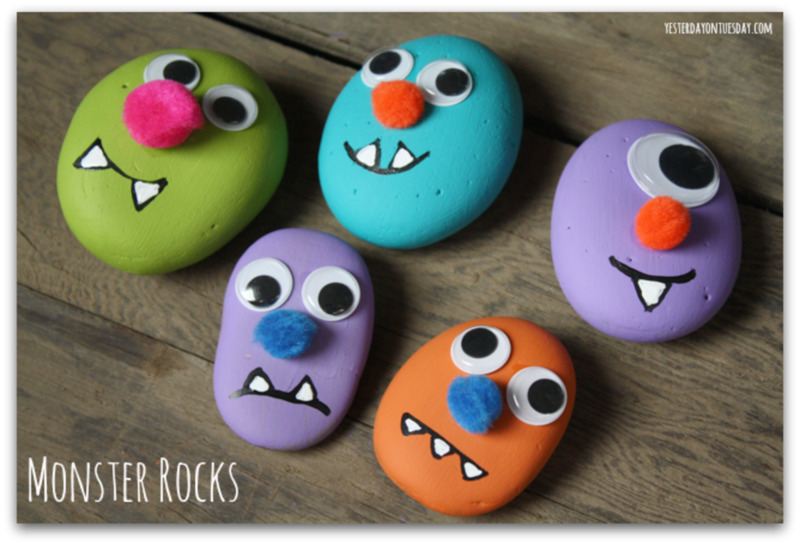 These are adorable Easter Crafts and congrats on Lens of the Day! I love easter. Congrats on LOTD. Great ideas &amp; love the way you show the steps with pictures. My sister has two little kids. I'm going to share this lens with her. Of course, I'm going to help make these crafts, because they look like a lot of fun! Congratulations on LOTD! Great ideas. Congratulations on a well deserved Lens Of The Day with this great Easter Kids Crafts!!! So adorable! 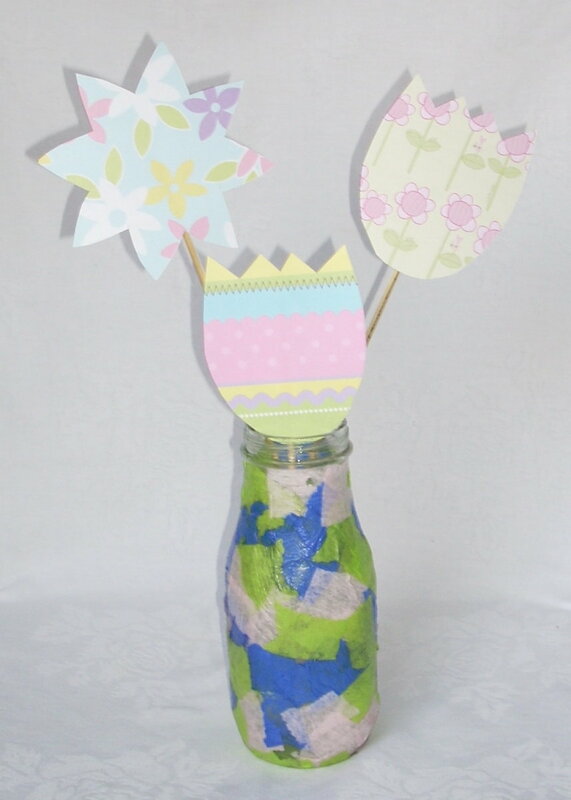 I don't know how a toddler's or older youngster's parents could resist these Easter Kids Crafts! Congrats on LOTD! Congratulations on LOTD! These crafts are so cute. Congratulations on lens of the day. These are great ideas. Thanks for sharing. Very nice lens. Interesting crafts for the kids. Very nicely presented. Thanks very much for your hard work. Oh my... these are crafts I haven't done for ages! I think I miss my work in schools a lot! 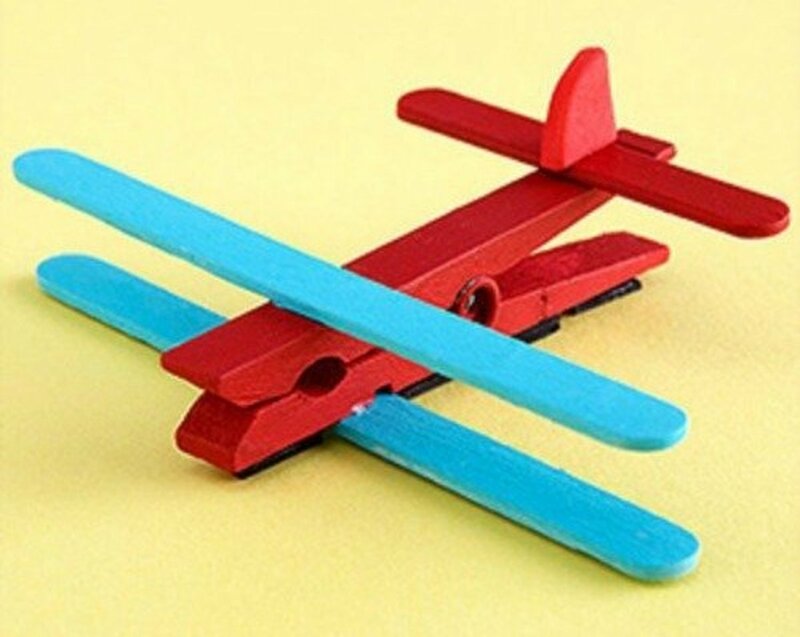 These were funny crafts to make and always pleased to parents! Definitely inspiring! These crafts are wonderful, and so is your lens. I'm definitely gonna adapt some of these ideas for cards to send to kids. I'm favoriting this lens. Five stars. Congrats on LOTD. Well deserved. Congrats on LOTD! Great job here. I love that stained glass egg and the valentine one you did too! Thank you - more than words can say. I am rejoicing too - this has made my day. My Squidoo friends have an extra special place in my heart - a space that grows larger every day!! !